Blue Sky BuildersSkywriters Garage BlogBlue Sky BuildersCan I Save Money By Installing Solar Panels on My Garage Roof? Now that spring has sprung, outdoor home improvement season is upon us. With Earth Day approaching on April 22, it seems appropriate to dedicate this post to a “green” topic: solar power. 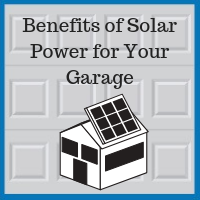 Specifically, does it make financial sense to use your Downers Grove residential garage to generate electricity with solar panels? The short answer is: Yes, thanks to current federal and state incentives. Does Solar Power Make Sense for DuPage County Homeowners? California is currently the biggest market for solar energy, largely due to aggressive laws promoting solar. One law even requires solar panels on all new homes effective January 1, 2010. So, you are probably wondering, how does Illinois compare? Illinois is currently ranked 34th out of the 50 states for the amount of solar power generated. However, thanks to new state programs that are just ramping up in 2019, Illinois is projected to rank 12th in the nation in five years. According to the real estate brokerage company Redfin, Chicago buildings scored 80 out of 100 on average for solar power potential; a minimum score of 75 is necessary for a building to be considered “good” for solar power generation. The average 6-kilowatt residential solar system costs roughly $20,000 upfront, but your cost could be closer to $50,000 if you have a larger home and want to produce more of your own electricity. While that may seem like a huge amount of money, there are significant incentives and savings. Right now in Illinois, you could break even in as little as 10 years, the point at which your cumulative financial benefits exceed your upfront cost. ComEd customers can get a complete financial estimate online that is customized to your address and past power usage. A homeowner who purchases and installs a solar system can claim 30% of their total investment as a federal income tax credit if the project begins in 2019. The credit drops to 26% for projects started in 2020 and 22% for projects started in 2021. On a $20,000 project, you will get around $6,000 back on your next tax return. Residential solar system owners in Illinois will be able to sell Renewable Energy Credits (RECs) through long-term contracts with the Illinois Power Agency (IPA), provided your system is installed by an IPA-approved vendor. You will be paid in year one for the value of the solar energy you will produce over 15 years. This incentive is estimated to pay back about 25% of your solar installation cost, or $5,000 on a $20,000 project. Given these federal and state incentives, a homeowner should break even on their solar energy project in about 10 years. Over the next 10 years after that, you should experience cumulative savings roughly equal to your installation cost. The U.S. currently has over 60 gigawatts of solar capacity, enough to power over 12 million homes, and this capacity is expected to double by 2024. Nearly two million U.S. households have installed solar panels. 2019 is a great time to consider making your home part of that expansion. If you want to make sure your garage roof is in good shape before you have solar panels installed, call Blue Sky Builders. We are a licensed Illinois roofing contractor and can help you with all of your DuPage County garage building needs. Call us at 630-852-8485 for a free estimate.